Of course we know to avoid snack foods like chips and pretzels when trying to cut salt from our meals. BUT you may be on a high-sodium diet without even knowing! 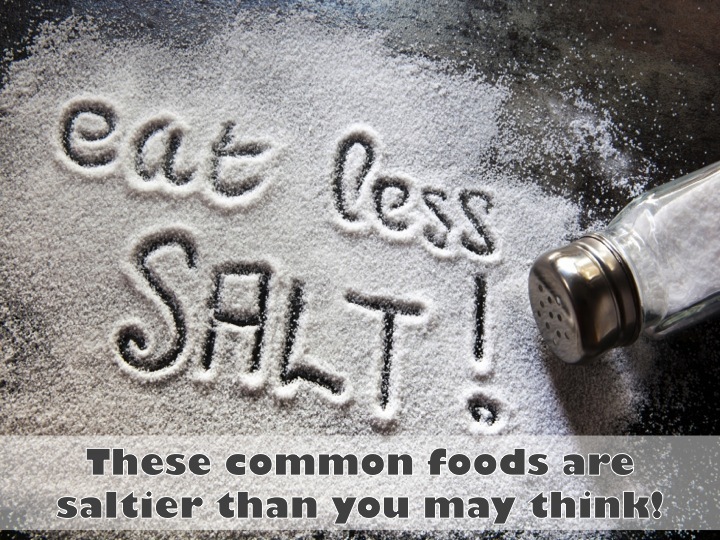 Many unexpected foods are PACKED high with salt! High sodium diets can lead to high blood pressure, heart failure, osteoporosis, kidney stones, and even gastric ulcers or cancer. How many of these foods are you unknowingly eating too much of? Cereal can be healthy way to start your day—or a salty one! Many cereals have 180 to 300 mg of sodium per serving—up to 12% of what you should consume in a whole day—and that’s if you only pour one serving in your bowl! We all know marinades and salad dressings have salt. But you may be unaware of how high the content really is! A two-tablespoon serving of salad dressing or barbecue sauce may pack 300 mg of sodium (10 to 15% of your day’s requirements)—and you often use two servings or more on your food! CUT THE SALT: Make your sale dressing and marinades at home. Bread is always a source of sodium, and bagels are no exception. In fact, one bagel can contain 460 mg of sodium, or 19% of what you should get daily. Add any flavours like cream cheese increase the salt even more! CUT THE SALT: If you have a bread craving try a thin bagel or think slice of whole wheat toast. We know tasty baked goods are high in sugar, but they are also full of salt. Things like donuts and cookies need salt to preserve their shelf life. CUT THE SALT: To curb a sweet tooth try fruit or dark chocolate instead! Think the soup at lunch is a safe option? Though a bowl might be less than 300 calories, a serving can contain half of your sodium limit for the day. CUT THE SALT: Avoid ready made soups and look for LOW-SODIUM options only.